I'll be honest, the game doesn't leave one with the best first impression. The tutorial mission and its mandatory boss fight may serve as a functional introduction to the underlying mechanics and action, but they definitely don't highlight the best parts of the game or just how crazy things can get after you sink your teeth into it for a bit. Once you get over the initial power trip of "I'M GOING TO MAKE A GUN THAT SHOOTS GUNS AND ALSO ROCKETS," there are a lot of interesting things you can do with the tools at your disposal. For instance, is gravity being a real drag and pulling down the shots of your heavy guns? Slap an anti-grav mod on that puppy and show Isaac Newton what you think of his laws. Of course, part of what makes the guns feel so good is how responsive and quick everything is, which is good considering you'll literally be dodging bullets. You start with a triple jump at the start, but you can spend your skill points or find temporary upgrades in the missions to increase that. This jump not only helps you get around, it's also the primary way you'll avoid some hairy situation. The unfortunate part about it is that the game isn't great about communicating what's around you. Enemies can sneak up on you pretty easily and you pretty much have to keep moving/looking around all the time to avoid it, which isn't great for anyone that suffers from motion sickness. The other issue with the lack of situational awareness is that you can easily land in a pit of lava or other environmental hazard when you intended to land on a narrow safe area. On the co-op side, playing through the game with a friend is a blast (no pun intended). Double the firepower means double the fun, and also double the chance to play around with some interesting gun configurations. Maybe you'll be the heavy weapons guy while your buddy opts for quicker/faster options, like energy blasters and chainguns. 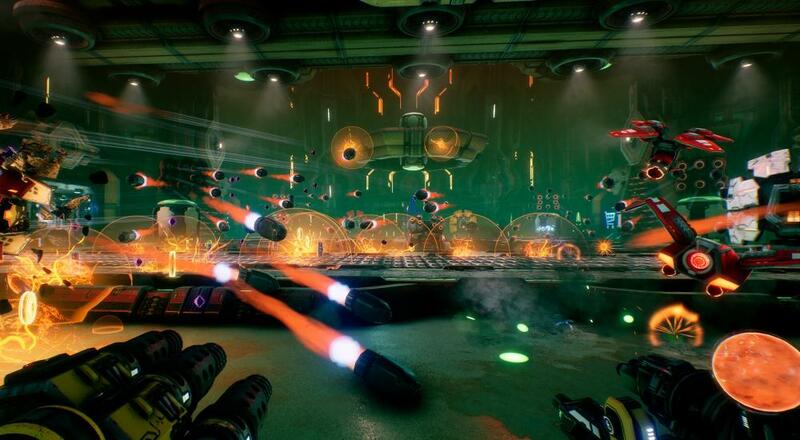 Given that the types of enemies you'll be facing quickly move from stationary turrets to flying drones, missile platforms, and some things that look an awful lot like the Spider Masterminds from DOOM, having a variety of weapons at your disposal is always a good thing. It's worth noting that while things like the gold coins used to buy new parts as well as experience are shared between players, the temporary upgrades only benefit the player that picks them up. MOTHERGUNSHIP is currently available on PC, PlayStation 4, and Xbox One. Two player online co-op is supported throughout the campaign once the initial tutorial mission is cleared.